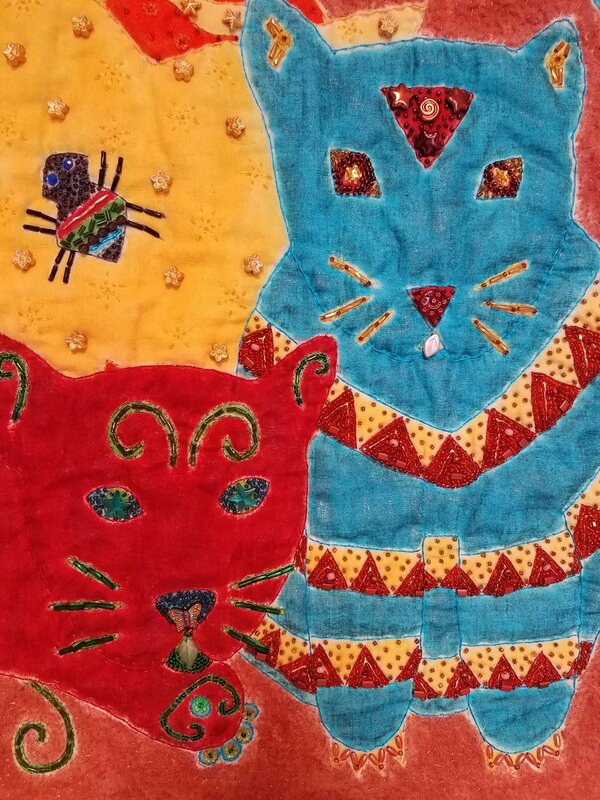 Crystal Lawrence of The Running Cat Studio is a Laramie, Wyoming based fiber artist who creates original artwork that will be on display and for sale at the 6th Biennial Touchstone Laramie Art Exhibition hosted by the Laramie Artists Project. Fiber artist Crystal Lawrence works with vivid colors on natural fiber. She experiments with many different dyeing techniques, thread work, and hand embellishments. Crystal applies these techniques to a variety of styles, including florals, animals and patterns found in nature, to create her lively, inspiring, and colorful works. You can see more of Crystal’s work from the Running Cat at Works of Wyoming in historic downtown Laramie, Wyoming https://www.facebook.com/WorksofWyoming/. This year Crystal will exhibiting new original fiber art for the 6th Biennial Touchstone Laramie Art Exhibition on November 10th and 11th, 2018 at the Fairfield Inn and Suites in Laramie, Wyoming.